Sunny roses, bright pink carnations, and lively button pompons are cheerfully arranged in a glass vase to bring happiness and warm wishes to Mom. Purple Stock, Assorted Lush Greenery and more. Standard Arrangement Measures 14" x 12". Happy Times for Mom Bouquet is a hand delivered gift. These gifts are delivered by one of our local design centers located throughout the United States and Canada. Same day delivery is available for most gifts when ordered before the cutoff time. 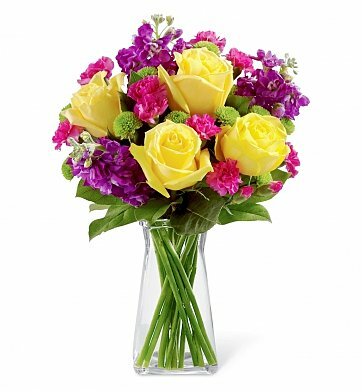 The cutoff time for Happy Times for Mom Bouquet is 2 PM in the recipient's time zone. The flowers were lovely and delivered exactly on time! Thanks so much! It was great, my sister really loved the flowers.